There’s no sugar-coating it: creating new sales opportunities from cold email is hard work. Each email you send competes with ~125 other business emails per day vying for the attention of your customer. While creating a strong initial intro email is important, most opportunities are opened from follow-up steps – often requiring 7 to 13 touches before a prospect becomes a sales qualified lead. *actual reply from a prospect revealing why they loved the format of the follow-up email. 1. Add a personalized, to-the-point subject line. According to Convince & Convert, 35% of recipients open emails based on the subject line alone. That stat alone should give you pause. Abraham Lincoln once famously said, “Give me six hours to chop down a tree and I will spend the first four sharpening the axe.” If honest Abe was sending an email today, he’d likely spend the majority of the time perfecting his subject line. It’s important that your subject line is intriguing, to the point, and experiments with personalization: whether it be the person’s name, their company or something they cherish. 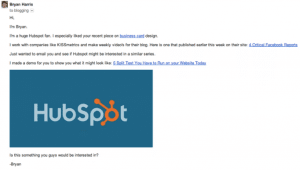 If you’re stuck or unsure which variation to try, use tools like CoSchedule’s free Headline Analyzer for inspiration. Pro-tip: For campaigns to non-executives, test an emoji in the subject line 🙌. Once taboo in business culture, emojis are becoming more accepted, and in many cases increase email open rates. For example, Experian ran an experiment and saw a 56% higher open rate compared to text only headlines. An emoji is expressive without taking much space and really stands out on mobile. 2. Use rich media to increase engagement. While products like Slack, Skype, and Google Docs have completely transformed the way we communicate internally with other team members, communication outside of your organization still defaults to email. Despite many advances since its invention in 1978, many of us still send emails like we’re living in 1997 (the launch of Yahoo Mail) – treating the medium like digital ink on digital paper. However, we often don’t realize that email is powered by HTML, just like web pages, and hold similar power & flexibility. 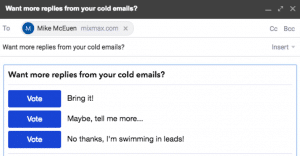 Many out-of-the-box solutions like Mixmax, Rebel, and Typeform now allow you to add interactivity to your emails, such as polls, forms, buttons, gifs, and videos baked right into the content – as opposed to attachments or outside links. Adding a poll, for example, can dramatically increase your response rates and lower the apprehension of a sales email. 3. Standardize & test, test, test. While testing your email content is encouraged, if you don’t have your sales stages mapped out and evaluate the impact of your tests, your pipeline will never become predictable. How each email relates to the buyer, and the greater conversation you’ve started. The end goal of each email: is it a reply? A meeting? Or to start a free trial? Example of a 13-step touchpoint plan – spanning across email, social, and phone calls. 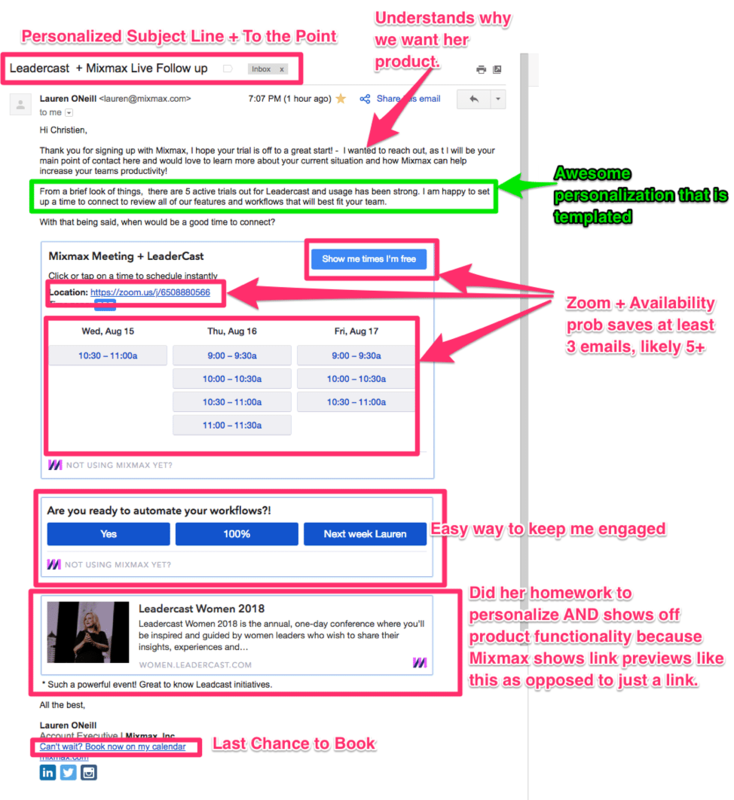 Once your touchpoint plan is mapped out, then you can properly create A/B tests at each email step to better understand the impact of each variation based on that stage’s goal. If you don’t have email software that automatically tracks the results of your tests, there are several free calculators that will help you determine the winning variation. 4. Leverage automation, but leave room for a human touch. With ~62% of a sales rep’s day being spent on non-selling tasks, automation software has been a godsend – freeing reps from dull, repetitive data entry, and allowing them to focus on customer conversations. However, fully automated email campaigns can come at a detriment to performance. 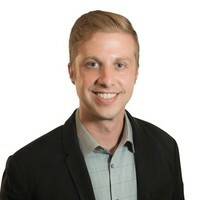 No customer wants to feel they are part of a one-size-fits-all campaign. We’ve all had the cringeworthy experience – whether it be an email or LinkedIn InMail – where the message wasn’t even directed to the right job function and clumsily clogged up our inbox. You don’t like feeling like an afterthought, and neither does your customer. Instead, ensure you have steps in your email sequence or campaign where a human touch and customization is applied. 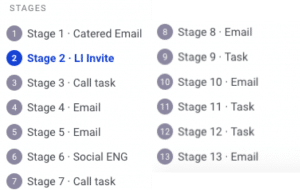 For example, you can still use automation to create a task to follow up with your customer; while also leveraging a battle-tested template to add structure and tracking to your email. However, you should still apply a personal touch that will make the email authentic. Say congratulations for major milestones: such as company funding, title changes, new product releases, etc. Browse their social profiles and relate to their hobbies, background, and interests. Do you both hike on the weekends, cheer for the same teams, have a weird obsession with Corgis, or graduate from the same university? Relate to their content. Executives and marketers often are required to write, and share their perspective to increase their brand awareness. Take the time to read some of their latest articles and add perspective. Hours of unforeseen work is poured into each thought piece, and authors generally love to hear people actually read their content. 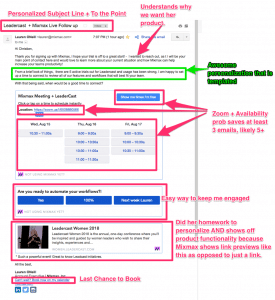 Crafting the perfect set of cold emails that lead to high reply rates and meetings booked comes down to two aspects: personalization & persistence. Ensure you’re speaking directly to your customer’s needs, wants and desires by doing your upfront research and adding personalization tokens in your email. Humanize your content whenever possible. Finally, remember the art of sales is in the follow-up. You often won’t receive a reply or action until 7 or more touches, so plan for the long game, while also adding value at each step (quell the urge to send the “just checking in” email). Good luck!